For the second day in a row I’ve been working with other volunteers setting up for Rotary’s annual Bookarama. It involves a lot of lifting, carrying and sorting. My Fitbit tells me I’ve walked more than 23,000 steps today – that’s more than 14 kilometres – and my arms tell me they’ve done a lot more work than they usually do. Tonight I’m grateful for the opportunity to relax and the satisfaction that comes from knowing I’ve earned it. E-books have their place but I still prefer real books. I like the feel of them, the way it’s easy to tell how far through I’ve got and to flick back if I need to check something I’ve read. I also like the way I can pass on a book to someone else, whether it’s a family member, friend or to help a worthy cause. Thankfully lots of other people are still reading real books and passing them on to Rotary’s Bookarama and today I’m grateful for them. 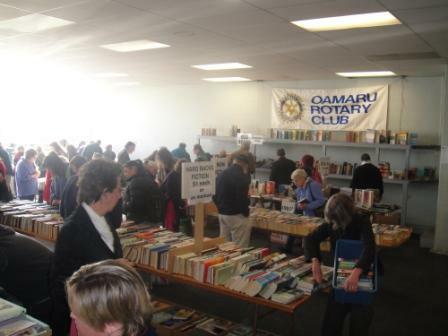 The Rotary Club of Oamaru’s annual Booakrama opened at 9 this morning. For the past few weeks members and friends have been sorting books donated by the public. It’s a fascinating exercise which shows there are a few too many people with a Presbyterian approach to books – they’ve been kept where they’ve got damp or just kept too long so they’re dirty and musty and have to be taken to the recycling centre or dumped. However while there are lots of those there are many more good books which will be snapped up by people whose search for a bargain contributes to the club’s main fundraising effort. How good a book is and what it’s worth exercises the sorters. Is a signed, first edition of a Wilbur Smith hard back a treasure or just another quick read? Are these old books precious or well past their read-by dates? We usually take the approach that the books have been given to us to be sold and it’s better to price them low and miss the odd windfall profit than to price them too high and have them left on the tables. Every now and then my farmer suggests we have too many books. I tell him there’s no such thing as too many books. Even though I spent three hours last night culling out 14 bags (about the size of ones from the supermarket) of books for the Rotary Bookarama and there are no gaps on the book shelves I’m not prepared to concede he has a point. The problem, if there is one, is too few shelves not too many books. You can’t judge a book by its cover, nor can you judge what someone will read by their appearance. Helping at last week’s Rotary Bookarama in Oamaru was a fascinating study in human nature. Had I put bets on what people might be interested in I’d have been sadlyout of pocket: the woman I thought might go for something literary opted for chick lit; the one I’d classified as a chcik-lit fan chose biographies; the mild-mannered bloke went for horror; one who looked like a professor bought westerns and a little old lady chose the raciest Mills and Boons. The club took in a little more than $10,000 which was up about $1,000 on last year’s total. That’s not a bad earner when most hardbacks were sold for only a dollar and paperbacks for half that.